When we set out to develop our wood barn sash, we wanted to retain a traditional appearance sash that would incorporate modern assembly methods and be easy to maintain for the end user. We started using a traditional profile with 2-3/8" wide stiles and top rail and the traditional wider 3-3/8" bottom rail. In the past, most barn sash were assembled using staples on the face in the corners and small wood glass stops which were then stapled, again on the face. That created unsightly fasteners which had to be filled before staining or painting your sash. We designed our sash so that the glass is installed durring the assembly process using profiled bars with grooves to create a fastener free face for ease of staining or painting. We also inset the edge fasteners so that each sash can still be trimmed up to 5/8" per side to adjust for your opening. We offer our wood barn sash in 5 popular sizes, and if you require a custom size or special lite pattern we will make that as well. Custom sizes are availble up to a max. of 44" in either dimension. 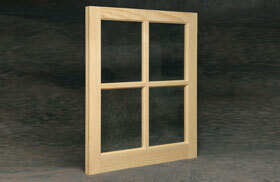 Whether Wood or PVC, we are sure you will find our "Traditional Series" barn sash to fill any needs you may have. BSW2025 8 x 10 2 x 2 20" x 25"
BSW2229 9 x 12 2 x 2 22" x 29"
BSW2429 10 x 12 2 x 2 24" x 29"
BSW2241 9 x 12 2 x 3 22" x 41-5/16"
BSW3129 9 x 12 3 x 2 31-5/16" x 29"